London Southend airport has retained its place at the top of a Which? survey to find the UK’s best and worst airports, this year sharing the honour with Robin Hood airport, Doncaster Sheffield. You can see how each of the 15 small airports and 20 large airports, including Gatwick, Heathrow, Manchester and Stansted, compare in our full survey results of the best and worst small and large airports. These include ratings for queues at security, check-in and at passport control, along with seating provision. 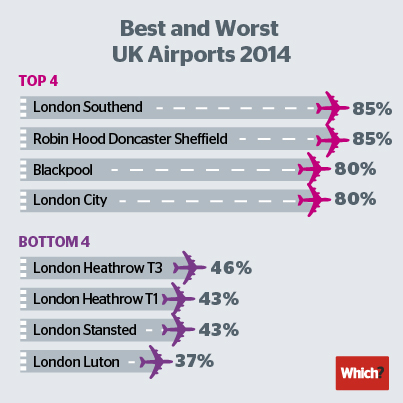 In a poll of more than 10,000 passenger experiences, London Southend and Robin Hood fared best, heading a list of 35 airport terminals and achieving an impressive customer score of 85%. Smaller airports are clearly providing a better experience as eight of them scored highly enough to be awarded Which? Recommended Provider status, but no large airports qualified for the award. Even the highest scoring large airport, Newcastle, on 66%, fell well short of its smaller counterparts. The lowest scoring, Luton, managed only 37% and was bottom of the list for the second year running. Which? members who passed through Luton airport on their travels were typically not so impressed with their experience. The UK’s sixth busiest airport achieved a pretty dismal customer score of just 37%, six percentage points down on its score in our survey last year. It scores just one out of a possible five stars in five separate rating categories, including queues at security and check-in and seating provision. Which? members described Luton airport as ‘the worst airport in the world’ and ‘an embarrassment to the UK’, while one member said they would ‘do everything possible to avoid this hell hole’. London Stansted and Heathrow’s Terminal 1 also scored poorly, both receiving a customer score of 43%, although Heathrow Terminal 1 fared better for airport pick-up/drop-off and queues at check-in, scoring four stars in both categories. In a separate snapshot investigation, we checked to see what savings can be made on package holidays when travellers are willing to fly from any airport, up to a two-hour drive from Birmingham, London or Manchester city centres. We found that holidaymakers could save almost £600 by switching their chosen airport on a seven-night break. A summer holiday to Portugal, departing from Luton with Thomson, could be £584 cheaper if you flew from Gatwick instead. Full details can be found in the September issue of Which? Travel. In June 2014, we asked Which? members to complete an online survey about their experiences of flying from and to a UK airport. Our results are based on 10,611 member experiences. Large airports have 4 million or more terminal passengers every year. Small airports have fewer than 4 million passengers.